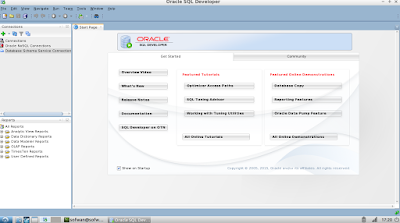 Get the software from oracle.com site. From this site, unfortunately no debian package available which Debian family use, there is only Linux RPM available for Linux and we will use it. We use asterisk (*) to represents the rest character. Install debian file above (sqldeveloper_4.2.0.16.356.1154-2_all.deb) by using dpkg tool, the internal package management tool for debian family. In my computer, it display /usr/bin/java . I just entry : /usr. Oracle SQL Developer also ask for adding command : SetSkipJ2SDKCheck true in product.conf manually. product.conf is located on /home/username/.sqldeveloper/4.2.0 and other location (You may choose one). You also can uncomment SetJavaHome and fill the value with your JDK directory. That's all. You type : sqldeveloper for any location to run SQL Developer. $ sqldeveloper. The software doesn't create shortcut manually in GUI, you can create by yourself.